if you are the copyright holder of any such media placed on this site and would like it removed, please feel free to contact with me at billysuederox@gmail.com. if you would like to submit material for consideration to be featured, you may also contact me at billysuederox at gmail dot com. if you need advice on love, life, what music to buy, you can reach me at the same address. if it's a funny question, i'll even place it on the blog! I’ve moved! I’m at http://www.billysuede.com now. I’ve already got a couple of posts up there so hurry up and come check it out, ya silly geese! Welcome To My New Home!!! Nitzer Ebb. Two words should say it all. Many may say it’s Front 242 but for my money these guys were the kings of what is known as EBM, or Electronic Body Music. What is EBM? Think industrial music with an actual melody. Anyways, back to the point. 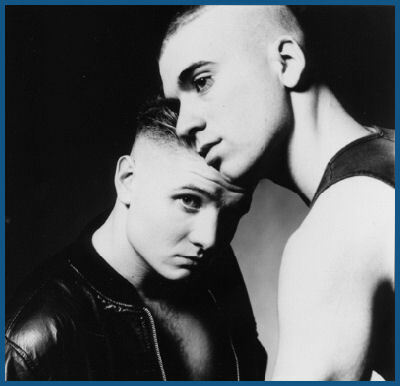 Nitzer Ebb wrote the anthems for a burgeoning sub-culture that was bored of new wave and wanted a bit more anger and nihilism in their music. The battle of Man v. Machine. Man v. Himself. Man v. anyone who was not him or her. Songs like Isn’t It Funny How Your Body Works, Join In The Chant, Lightning Man and Shame remain staples in any industrial club night you may visit and the reverence for this seminal duo remains as strong as ever. Now fourteen years after their last record, 1995’s Big Hit, the duo of Bon Harris and Douglas McCarthy are back with a brand new record Industrial Complex (Tour Edition) due out 22 January via Major Records. Upon hearing some of the tracks of the record, allow me to simply state that old school fans of the band should be very encouraged as the band sound like they’ve lost none of the passion and vigor and actually sound inspired again. The band is currently on tour through the States and reports from the shows have been glowing to say the least. 2010 is the year of the Ebb and thanks goodness. To whet your appetite, I’ve included a bit of a treat for you! Here I am sitting at my desk thinking about what to pontificate about when it dawned on me. Since I listen to music just about every chance I can (which seems to be all the time), I should talk about a song that’s got me all doe-eyed at the present time. Right now, that song would be Goodbye by the one and only Psychedelic Furs. Easily one of my top five favourite songs from an all-time great band. It’s difficult to pinpoint exactly what it is about this song that makes me swoon. The saxophone? The perfect unison between Tim Butler’s bass and Vince Ely’s drumming? Richard Butler’s Bowie/Rotten lovechild-esque vocals are always a given so that element doesn’t count. Maybe it’s simply the way simply comes together to form an underrated new wave classic. What’s more Goodbye follows the seminal 80s classic Love My Way on what is my favourite Furs record, the Todd Rundgren-produced Forever Now. What better way to follow up such a timeless single than with an absolute stomper such as this? I don’t know if I’ve stated my love for Australia’s Modular Recordings enough here. They are by far my favourite indie label these days as they consistently put out quality releases and have brought some brilliant tunes from down under giving some great artists a chance to shine. From the Presets to Ladyhawke to Cut Copy to Van She, it doesn’t stop. Of all the bands on the label that have stolen my heart on countless occasions, none do it quite so effectively or with such stealth as New Young Pony Club. Their 2007 debut Fantastic Playroom was pure new wave heaven. It speaks to how great and solid a record is when you can easily play it two years later and still feel the impact you did when you first listened from track one to the end. That kind of replay value holds true here. At long last, I’m happy to say the band is back! There is a new single afoot! It’s called Lost A Girl and it retains the band’s relentless charm while making things a tad but darker. Less pep, less immediate than The Bomb or Ice Cream but the band is better for it. Tahita is still the star of the show here with her simple lyrics delivered with such panache, you’re sucked in instantaneously. NYPC , on the debut blended perfect pop moments with killer grooves showcasing some honest to goodness musical chops. That is still evident here in case you were at all concerned. Prepare to fall in love with the Pony Club all over again. The new EP from the Pet Shop Boys is out tomorrow via Astralwerks. I can hardly wait! To celebrate the release, Parlophone presents with a promotional video of All Over The World with footage from the recent Pandemonium tour. A brilliant song from a brilliant record. Enjoy! Some bands make it seem too easy. autoKratz are one of those bands. The London duo has been making waves and making friends in the electronic/dance circuit in the last couple of years which has resulted in a deal with the Kitsune label and a major buzz. One listen to a song like Always More and it’s really not hard to see why. Minimal electronic dance pop at its finest. Everything is clean, everything is crystal. A tried and true dance progression and the lead…the lead…the not-quite dissonant lead. I just need to say how much I love the lead. For me, it makes the song. Add in the smooth vocals by singer/guitarist David Cox and you’ve got yourself a brilliant dance-pop track. Their debut record Animal is out 3 March here in the States. Let’s hope they come out here for some shows because rumour has it, the duo absolutely kill it live. With everyone having 80s fever these days, you knew it was only a matter of time before we would start hearing the return of the 80s urban sound to the fold. What wasn’t expected was that it would come from a certain trio from Denmark of all places? With a sound that brings to mind the blue-eyed soul of Scritti Politti and an ultra-slick video replete with beautiful video that would make George Michael stand and applaud, May I bring you Private! My Secret Lover was originally released in 2007 through the Swedish label, Labrador and was given heaps of praise throughout Scandinavia. The band was also being championed by esteemed blogger, Arjan Writes for what seemed like forever. It seemed the band either couldn’t get the proper backing or the greater public simply wasn’t ready for this Danish band but luckily it appears they’ve gotten a new lease on life. The band is ready to give the second chance this time with the help of Relentless/Virgin and hopefully My Secret Lover will find the audience it truly deserves. “My Secret Lover” by Private.